Do you have a family history of diabetes and still have never cared to get your blood sugar levels checked? Are you a diabetic with cardiovascular problems or hypertension, and still have never cared to get your kidney function tested? If you fall in any one of the above categories, you need to sit up and take note. A disorder with far reaching consequences, diabetes is not just a malfunction of glucose metabolism in the body, it is an ailment that systematically effects different organs of the body one after the other. There is a close connection between diabetes, blood pressure, heart ailment and kidney failures. A person with diabetes is at the risk of all these conditions and needs persistent management to keep his or her sugar levels under control. Diabetes, if not controlled and managed, can damage the kidneys and cause renal failure – a potentially fatal consequence. In fact, a majority of patients with kidney failure are patients of diabetes. As many as 30-40% of kidney failures happen as a direct consequence of diabetes and a majority of people who end up having kidney transplant are diabetic. Yet, a large number of people with diabetes remain oblivious to this connection and do not care to get their kidney function checked. At the same time, a large number of people who have a family history of diabetes, putting them at greater risk, do not care to get themselves screened for the disorder. “Diabetes, cardiovascular diseases and kidney function are all closely connected. Most of the time there is an overlap of these problems in a patient as one thing leads to the other. People who have diabetes are at an increased risk of developing heart disease as well as kidney failure; and both the consequences can be fatal if not detected and controlled on time. However, there is a gross lack of awareness among people about the severity of this threat. Most people tend to take diabetes very lightly,” says Dr P N Gupta, Senior Consultant Nephrologist, Paras Hospitals, Gurgaon. Early detection is hence the key to saving a large number of lives. It is crucial to detect the patient who has diabetes and blood pressure in time to take corrective and preventive measures. Timely detection can only be done if people are regularly screened and checked for abnormal blood sugar levels. People with diabetes often experience sweating on the face and feet, they develop loss of appetite, experience breathlessness when they work. They are prone to feeling weak and tired. However, these are all non specific symptoms which can at best be regarded as indicators. “If you have a family history of diabetes with any one of your parents having the disorder, you need to be strictly at guard and start getting yourself screened regularly after you turn 30. If you are identified at a pre-diabetic stage, effective measures can be taken to prevent the progression of the disorder. 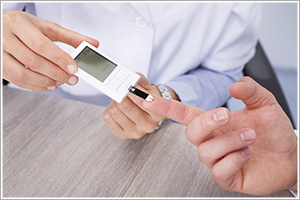 This can prevent a number of functional complications that accompany diabetes,” says Dr Gupta. Cardiac patients too need to be careful about their kidney function. Kidneys often get affected in cardiac patients because of the low pumping of the blood from the heart to the kidneys. This is why a number of people who have heart disorders have their kidney functions affected. As cardiovascular diseases and diabetes take alarming proportions in India, this will automatically lead to increased cases of renal disorders and failures, necessitating more transplants and dialysis. “We need to incorporate some early screening programmes in our healthcare system to detect these cases, so that they can be managed in the best possible way. Diabetes screening should be encouraged in people with a family history of the disorder. At the same time, kidney function tests should be regularly conducted in people living with diabetes and cardiac ailments,” says Dr Gupta.